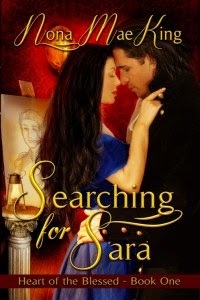 Searching for Sara: Heart of the Blessed book 1 by novelist and award winning author, Nona Mae King, brings faith, hope, suspense and romance to the heroing tale of Sara Little. Set in 1892, Sara’s heritage begins with the poor working class of London. With little hope for a better life, Sara finds favor with handsome widower Christopher Lake. Recently widowed, Lake mourns his beloved wife; he swears allegiance to his wife and her last request – provide for Sara and elevate her place into society’s elite. Upon such an undertaking, Christopher discovers that Sara has an amazing artistic talent, worthy of the finest patronage. Coaxing her out of her own familiarity, her new benefactor, has arranged for Sara’s masterpieces to be displayed among the wealthy aristocratic society. Not accustomed to this, Sara’s shyness leads to Sara insisting on remaining anonymous amongst these socialite events. Christopher quickly comes to realize that perhaps he has taken on more than he had anticipated. And Sara, battles not only her place in society, but a love that has begun to bud for her benefactor, yet is she worthy of him? This new love, set in the romantic gestures of the past, may or may not survive…is Sara worthy? Will society let their pure love flourish? Take a journey into the past, to a discovery that all endings have new beginnings. A fast-paced novel by Nona Mae King unveiling true love and offering faith in the impossible, giving hope for a bright future, even for the most common of subjects –Searching for Sara: Heart of the Blessed – a time of innocence, leading to a blessed life. You may get your copy ofSearching for Sara: Heart of the Blessed at Amazon, in Kindle Edition, at Nook Book and at other fine online bookstores. You may visit Author Nona King at her website, Angel Breath Books where you will find further information about the author and her books. ~ by inhisgloriousname on June 24, 2014.